The History of the Poolies can be traced back to 1881 with the formation of West Hartlepool Amateur Football Club who won the FA Amateur Cup in 1905 beating Claptam 3-2 at Shepherds Bush in London. In 1908 Hartlepools United were formed and took over land at the Victoria Ground which had previously been occupied by the defunct Rugby Club. Hartlepools (Plural) was because of the two boroughs of Hartlepool and West Hartlepool. Their often referred to nickname of "Monkey Hangers" stems from the time of the Napoleonic Wars when a French ship was wrecked off the Hartlepool coast. The only survivor was a monkey, which was captured and questioned by local fishermen at a beach court. Unfamiliar with what a Frenchman looked like the fishermen were unable to understand the monkeys replies to questions and they concluded that it was a French spy and sentenced it to death. The unfortunate creature was hanged from the mast of a nearby fishing boat. Bulls News hopes that GT will offer Alex Jeannin suitable protection if he travels with the party on Saturday! The existing ground, Victoria Park, is in Clarence Road and was improved dramatically in the 'nineties with the covered, seated Rink End Stand now providing accommodation for visiting fans who are advised to wrap-up well to protect from the wind which blows off the North Sea. Admission is £18 for adults and £9 for concessions (U16 and over 65). A student (in full time education) ticket can be purchased from the ticket office subject to valid proof of identity. These are not available at the turnstiles. By Car - Travel to Worcester and join the M5 (north) joining the M42 at J4a. At the end of the M42 continue onto the A42 joining the M1 (north). At M1 J43 take the left hand lanes (sign The North, Leeds East). At M1 J47 continue forward sign The North (A1), Wetherby M1 then join the A1M. At A1M J45 continue onto the A1 (sign Wetherby). At junction for Wetherby (A661) continue forward (sign The North). Continue onto the A1M. Leave the A1M at J49, Dishforth Interchange, and merge onto the A168 (Thirsk, Teeside). Continue forward onto the A19. After the Tees Viaduct branch left, and then at the roundabout take the third exit onto the A139 (sign Billingham). Take the ring road around Stockton On Tees following signs for Billingham then join the A689 (sign Hartlepool). Follow the A689 towards the Town Centre. Follow Town Centre signs for 2.8 miles, over two roundabouts. Go straight over the next two sets of lights, passing Hartlepool College on your right. The next left takes you to the stadium. For Sat. Nav. users, the postcode is TS24 8BZ. According to AA Route Planner, the distance is 250 miles and a drive time of over 4.5 hours is suggested. There is a good-sized car park at the ground and plenty of street parking behind the away end. HUISA: Coach due to leave Hereford at 7.30am. Fare £25 Details from the club on 01432276666. HUMADS: Coach from Malvern leaving at 8.00am via Evesham. Fare £20. A few seats left contact Reg on 01684572945. Refreshments. The Victoria Suite near the entrance to the away end is for members only. At the same end but at the opposite corner, is the "Corner Flag Supporters Bar" that welcomes away fans. The entrance fee is 50p, but the bar has a good pre match atmosphere and SKY TV. Popular with away fans is the Jackson's Wharf Pub near the ground. It has good food and real ale on tap. This pub is over the road from the ASDA store, to the left of the old sailing ship. Otherwise the ground is not far from the town centre where there are plenty of pubs to be found. Those of note include The Causeway, The Tap and Spile and The Brewer and Firkin. There is also a Yates Wine Lodge but I understand the Wetherspoons outlet has been sold off. If in doubt, just head for the seafront where you will find more Pubs/Bars than you can cope with. Trent McClenahan's Australian side drew with Iran 0-0 in the qualifying Olympic game earlier today. The game took place in a nearly empty Azadi Stadium in Tehran. The Aussie defenders were said to have easily contained the Iran forwards. McClenahan is due back at Edgar Street later tomorrow. Tranmere Rovers manager, Ronnie Moore, is keeping tabs on Steve Jennings, who is currently on loan at Edgar Street. Soccer 365 reports Moore as saying that Jennings has a future back at Tranmere. Initially Jennings came to Hereford United for a month but that loan has been extended to cover the remainder of this season. "Steve went there to get some games and at the moment he is still in my plans for next season," said Moore. "He just can't get a game here at the minute due to the experience we have with [Paul] McLaren, [John] Mullin and [Jason] McAteer in midfield." 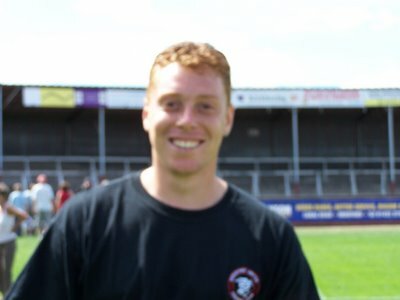 Jennings has put his experience to good use in the Bulls' midfield and has partnered Ben Smith since the latter joined from Weymouth. That partnership has only been on the losing side once in six games to date. York City have new owners. JM Packaging, the company of long standing Managing Director Jason McGill, is now 75% owner of the club after buying a majority stake from the supporters trust. The trust remains 25% owner but was unable to provide funding for the stadium move the club desperately needs. Accrington have confirmed the installation of new floodlights that will enable the club to remain in the league at the end of the season. The existing 250lux lights have been upgraded over the 350lux requirement at a cost of £20,000. The Bulls did similar work to their lights last season. Graham Westley has said he has not been informed why he was dismissed as Rushden boss: "I'm only guessing that while Garry was available, they felt he was the better man to take the club forward. So they made the decision to move me out and bring him in which you have to commend in terms of the courage of the decision and I genuinely wish the club all the very best in going forward." Torquay are having trouble attracting players to their fight against relegation. Keeper Kevin Miller rejected a second month on loan to sit on the Southampton reserves' bench, with Colin Lee telling the local press: "The players themselves are looking at our situation and, basically, quite a few of them don't fancy it." Bristol Rovers are into the Johnstones Paint Trophy final in Cardiff after last night's 1-0 win over Bristol City. Rickie Lambert scored only his fourth goal in 31 games, but has probably repaid the £200,000 transfer fee in one go, as his 'rocket volley' seperated the two sides. Rovers will meet Doncaster on April 1st. Chester manager Mark Wright has praised striker Simon Yeo after last night's game, and was satisfied with the point. His goal was his first from open play since arriving at the club, and Wright was pleased with the quality: "I thought a draw was a fair result. The conditions didn't help either side, but it was a pleasure to see Simon Yeo scoring such a good goal. Simon is a predatory striker and when he gets into that sort of position you know there's only going to be one winner." The lowly attendance last night of 1,842 was Chester's fifth sub-2000 gate of the season, and less than half the crowd that watched the reverse fixture at Edgar Street. Meanwhile, Bulls legend Jimmy Harvey heaped praise on Danny Carey-Bertram after his first goal for Forest Green last night denied former club Cambridge all three points: "I was pleased to see Danny show the potential that I believe he has, and on another night he could have come away with a hat-trick. He knows their players and he maybe felt like he had something to prove." Forest Green have, however, released former Bulls winger Danny Williams by mutual consent after playing 19 times since a summer move from Stevenage. The former Chesterfield trainee, who turns 26 on Friday, has played over 100 Conference games for three sides. Graham Turner, the Hereford United manager, spoke to the press after last night's game at Chester. "We go home disappointed because we passed the ball well but we just didn't get on the end of crosses," said Turner. "Sometimes you need a bit of luck and when the ball hit the bar and then the rebound hit their keeper who was on the ground, then maybe it just isn't your night. "In the end I'm quite happy to get a point after we went a goal down, but we really needed all three to get towards the play-offs. "We got enough balls into their box but we should have got on the end of them." The Bulls visit Hartlepool on Saturday looking for a double over the league leaders. Back in August, the Pools visited Edgar Street and lost 3-1 as their first season back in League Two started very badly. Tim Sills, Rob Purdie, and Andy Williams provided the goals for the Bulls with James Brown scoring for the visitors. The last visit of Hartlepool to Edgar Street was a FA Cup match in November 1999. A Rob Elmes goal was the difference as the Conference side beat the League One side. Pools defender Mickey Barron is the only player to have played in both games. Since that game, Hartlepool's form has dramatically improved. After failing to win any of their first five matches back in the basement, they are now 18 league matches unbeaten and have won the last six - keeping 13 clean sheets in the 18 match run. Nine goal top scorer Jon Daly departed for Dundee Utd in the transfer window and five goal loanee Daryl Duffy has returned to Hull leaving four players on four goals each. The Bulls are unbeaten in four and, on their travels, have beaten every top five side they've played culminating in the 4-1 demolition of Lincoln last Tuesday. Alan Connell's late strike at Chester makes him the Bulls leading league scorer with eight, followed closely by Andy Williams with seven. With Stuart Fleetwood returning after a disappointing spell at Accrington, Graham Turner will have to decide the future of Steve Guinan after Saturday's match. Hartlepool United vs Hereford United, Victoria Park, Saturday 3rd March, 3.00pm. HUMADS: Coach from Malvern leaving at 8.00am via Evesham. A few seats left contact Reg on 01684572945. FUNBUS: Expected to travel. More later. Meanwhile Hartlepool manager, Danny Wilson, is expected to be named the League Two manager of the month. His side are top of the League and have won their last six League games. However the award of the MOTM sometimes comes with a string in the tail and Hereford United will be hoping that Pool's form takes a knock on Saturday. Simon Travis, interviewed for BBC Hereford and Worcester after last nights game at Chester, though the Bulls deserved more from the game. "First half we were playing into the wind so it was difficult, but I thought we played some good football. "Then second half, with the wind, I thought we did enough to win the game. "Alan (Connell) was unlucky with the free kick, we had a couple of shouts for penalties turned down. We were unfortunate to come away with only a point." Mark Wright thought Chester deserved a point. "I thought a draw was a fair result. The conditions didn't help either side, but it was a pleasure to see Simon Yeo scoring such a good goal," said the Chester manager. Hereford stay in ninth position after the draw but are five points outside a play-off position and have played one game more than seventh placed Wycombe. Although officially credited with only 54% of possession, the Bulls dominated much of last night's game at Chester. The corner tally of eleven to the Bulls and just three to Chester proves the point. Scorer Alan Connell received a top mark of eight whilst for Chester scorer Yeo and goalkeeper Danby received an eight. Danby had a very good game as he made several excellent saves and kept his side in the game. Although there were twice as many Hereford fans as at last week's game at Lincoln, the support was less vocal probable due to the narrowness of the away stand which meant fans were more spread out. Praise for the stewards letting cars out of the ground after the game. Whereas at some grounds there is no help, stewards last night ensured a sensible flow of traffic out of the ground. Hereford United's rearranged away fixture at Chester City went ahead tonight, and The Bulls will leave the Deva Stadium feeling hard done by as they managed to collect just one point, having gone behind with twenty minutes to go. Graham Turner was forced into a change at right back with Trent McClenahan away on international duty, meaning a return to the side for Simon Travis. Also in defence, Tamika Mkandawire returned in place of Richard Rose, but suprisingly didn't take the captains armband; that duty remained with Ben Smith. The opening moments of the encounter remained to The Blues, who notched up three corners but the opening danger came from United, through Travis. His run down the right flank and then one-two pass with Steve Guinan as he cut inside, resulted in a drive at goal which needed to be palmed over by Jon Danby between the Chester City sticks. United dominated proceedings from then on, but couldn't create any real threat on goal, and at the other hand Wayne Brown, formerly of Chester, had to be aware as Lee Steele fired over from twenty five yards. The windy conditions were proving influential on the flight of the ball, but it seemed to be Chester's backline who were struggling most because of this, and Danby was put in a couple of difficult positions, though Hereford couldn't capitalise. Before the break though a moment of magic from Alan Connell, who took the ball down with a fantastic touch and then picked out Andy Williams, brought about a good chance, but Williams' effort went behind off his own player, Danny Thomas, who was again a live-wire on the left. The second half contained more incident than the first, with United shooting towards their vocal 299 supporters in a crowd of 1,842. It was the hosts who had first sight on goal though as Kevin Sandworth fizzed a ball across the goal face. Almost immediately after a direct ball down the left found Thomas who skinned the right back before cutting inside from the by-line and winning a corner off a covering centre back. Then came Hereford's best chance of the game, with Guinan chesting down for Smith twenty five yards, and the midfielder hitting a stunning, controlled volley that beat Danby, but was denied by the cross bar. Connell was in first to the rebound, but it came at him a bit quick, though his on-target header needed to be turned behind by the legs of the 'keeper. Guinan then went about setting Williams away down the right, but Williams' delivery was beyond Guinan and Connell before disaster struck for the visitors. Chester's direct approach paid dividends, as a long ball from defence picked out the run of Simon Yeo, who'd gotten the better of Mkandawire and the striker raced away to slot low past Brown, who can't have enjoyed that moment in front of the fans of his ex-club. Eight minutes from time though, Hereford got back on level terms. Smith returned the ball to Thomas on the right, where he'd just taken a corner from, and the winger crossed into the front post. Connell and Phil Bolland challenged for the ball, and it looked to be going out, but right on the line, and maybe in an offside position, Dean Beckwith (later subbed with a hamstring problem) nodded the ball back towards Connell. Then, with his back to goal at the near post, the striker performed a stunning bicycle kick to make it 1-1, and that was how it finished. Much like Saturday, Hereford will feel slightly aggrieved they didn't take all three points away from this one, especially as they had more of the game this evening than they did against Rochdale. They managed to avoid defeat though once again, and showed good character in digging in and equalising, having gone a goal down against the run of play. Graham Turner's men might have to work a little harder on the weekend though, as they face league leaders Hartlepool. HUFC: Brown, Travis, Beckwith, Mkandawire, Purdie, Thomas, Jennings, Smith, Williams, Connell, Guinan. Subs: Rose, Thompson, Ferrell, Jeannin, Sills. CCFC: Danby, Linwood, Bolland, Artell, Hessey, Kearney, Meechan, Hand, Sandwith, Yeo, Steele. Subs: Allen, Bennett, Vaughan, Wilson, Holroyd. Stuart Fleetwood has returned to Edgar Street from Accrington Stanley according to BBC Sport. 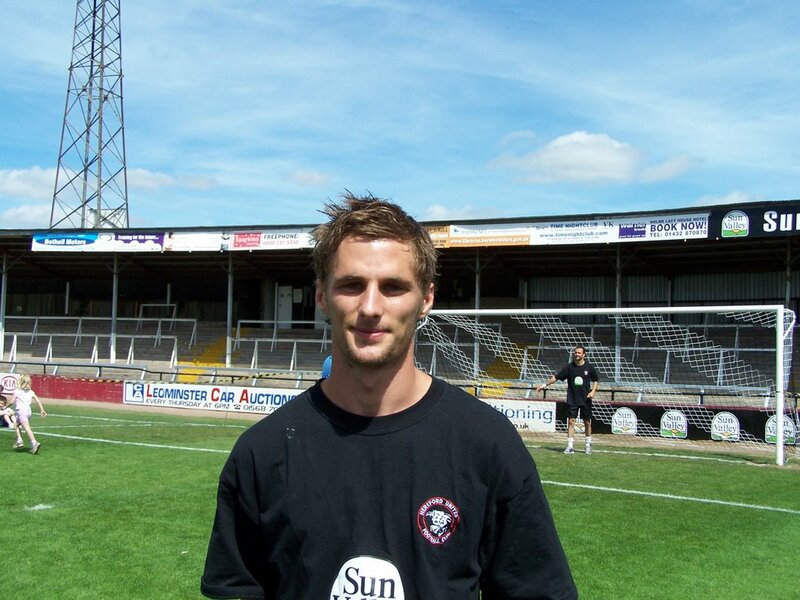 The Hereford United striker could only muster two goals for Stanley whilst on loan and they were for their reserves. Stockport have made an official complaint to the Football League over the postponement of their match with Bristol Rovers at the weekend. The media have suggested that Rovers cajouled the referee into a decision as their injury crisis worsened. Rovers head coach Paul Trollope has denied any 'conspiracy theory', saying that the pitch wasn't playable long before the match was called off at 12.30pm. Kidderminster boss Mark Yates has apologised for his behaviour during the Lee Elam headbutt incident, saying: "Kidderminster is a family club and I am a family man, and my actions were out of keeping with my character. The frustration and pressure of the job is no excuse. But I am a young manager and have learned a lot from this regrettable incident." Boston manager Steve Evans has asked his board to provide one of football's basic requirements - a physio. The club have been without a full-time physio for the last month since Lee Taylor left the club and their matchday physio is too ill to perform his duties this weekend. An entry posted by Gareth Sheldon to Myspace suggests the player has been released by the Bulls. The entry, to former Kidderminster team-mate Russ Penn's Myspace page, says Sheldon has had his contract paid up. The winger was seen as a gamble by Graham Turner when he became one of the first pre-season signings but has only made four starts, the last in November. Meanwhile Jon Wallis, on loan at Dagenham, played and scored for Dagenham in an Academy game against Ilford. This evening's League Two match between Chester City and Hereford United should go ahead as planned. Although there has been some rain at Chester overnight, it is currently (10am) dry but cloudy at the Saunders Honda Stadium. There is expected to be another band of rain/showers in the area this afternoon but this should clear in time for the kick-off. However it will be quite gusty. Meanwhile Chester manager Mark Wright is expected a tough game this evening. "They are a well organised side and have been gaining some good results of late. Defensively Hereford are well organised so we know that they will be hard to break down. "We have been working hard to bring in reinforcements to our squad, but at this time of the season it is always difficult to bring in the sort of quality you need." Finally there will be live coverage of the (UPDATE) all of the match on BBC Hereford and Worcester on 94.7FM. Richard Hammond, one of the presenters of BBC2's Top Gear, is to help promote the Edgar Street Grid at Cannes. Hammond is to join up with Advantage West Midlands to help promote £550 million worth of development opportunities being presented at next month's MIPIM 2007 property show in Cannes. The regional development agency is planning milestone announcements at MIPIM involving four key projects across the region including the Edgar Street Grid, in Hereford, which is a £150 million retail and residential development covering 100 acres north of the city centre and includes the home of Hereford United. Key decision-makers and investors from the land and property industry will be among more than 21,500 visitors to Cannes between March 13-16. Hammond will be the guest speaker at a high-profile AWM developer dinner on the first night. "Hammond is incredibly popular with the public but he is also a respected journalist, admired by the business community. He was brought up in the West Midlands so he's an ideal advocate for the region," said one of the organisers. Graham Turner will need to make at least one change for tomorrow's game at Chester as Trent McClenahan is with the Australian Olmpic squad. There are several options available to Turner including the recall of captain Tamika Mkandawire. Simon Travis may not make the squad despite being on the bench last Saturday as his heel injury has become infected. Rob Purdie missed training today with a shoulder injury but is set to play. Meanwhile Turner told the Worcester News that it will be a massive game. "We are in the middle of a good run of form and we have to keep that up if we are going to get into the play-offs. "Chester are a big, strong side who will give us a real battle, but I am confident we can go up there and get a positive result. "We had them watched last Wednesday when they beat Bury 1-0 with a last-minute goal and they are battlers who can grind out a result. "They are a physical side, but they are well-organised too." Chester manager Mark Wright has complained about the lack of forward options in his squad. The often controversial manager saw both Jon Walters and Gregg Blundell sold in the January transfer window with Forest Green's Alex Meechan and Peterboro's Simon Yeo coming in. The club have just three experienced forwards, plus youth product Chris Holroyd. Wright told the local press: "We sold our two top scorers and we have not replaced them. I don't want to be too down on the people we have up front, but you can't sell your best players and improve your side. "With the injuries we have I can't keep pulling rabbits out of hats. I know the board are trying to get players in for me, but how can you bring players in at this stage of the season, it's impossible to do." Wright has also seen Roberto Martinez, their third top scorer this season, move to Swansea leaving defender Ashley Westwood as the club's top scorer on three league goals. The club has also had to offload strikers Jermain McSporran and Drewe Broughton in order to remain under the squad budgeting rules, leaving them with four forwards that have scored just two goals in the league for them this season. By comparison, the Bulls have five players with three or more league goals this season. Rushden have appointed Garry Hill as their new manager. The former Weymouth boss arrives at Nene Park with assistant Kevin Hales less than 48 hours after Graham Westley was sacked. Westley survived just 11 league matches, with the club on a seven match unbeaten run. Diamonds chairman Keith Cousins told their official site: "This is obviously an exciting time for everyone involved with Diamonds. Garry was our unanimous choice as a successor to Graham. He is extremely well regarded in this division, has numerous games of management experience under his belt and his record at this level speaks for itself. I have no doubt in my mind that it will be a good partnership and that he is the right person to take the club forward". This is an updated article originally written by Ex-Landlord. Chester Football Club were founded in 1885 as an amalgamation of Chester Rovers and Old King's Scholars and initially played their home games at Faulkner Street in the Hoole area of the city. A couple of other grounds were used before they settled at Sealand Road where they remained until the end of the 89/90 season. The sale of the Sealand Road ground in 1990 saw Chester forced to play their home games at Macclesfield for two years before returning to the City at the new Deva Stadium. Their recent history include events which closely resemble those of HUFC, relegation to the Conference, defeat in the play-offs and finally promotion back to the Football League. Lets hope that our Edgar Street ground will soon see the sort of improved facilities that Chester have but without the need to move to the extremes of an edge of the City Industrial area. Visiting supporters are accommodated in the South Stand (terrace) and a section of the seated West Stand. Admission to the terrace is £15 for adults, £10 for concessions and £5 for U16's. Equivalent seated costs are £17, £12 and £6. By Car - For those taking the M5/M6.M56 route, Follow the M56 to where it ends at a roundabout, turning left (sign posted North Wales, Queensferry, A5117 & A550) onto the A5117. At next roundabout by Little Chef, turn left (sign posted Chester A540). At next roundabout (approx 3 miles), take 3rd exit (sign posted Queensferry A5480, Sealand Road Industrial Estate, Retail Parks) onto the Deva Link Road. At roundabout after 0.7 miles continue straight on (sign posted Sealand Industrial Estate). At crossroads by MFI Homeworks, go straight across into Bumpers Lane. Ground is on right hand side, at end of road. Alternatively, take the A49 to Slopland then, at the Garden Centre roundabout join the A5 towards Oswestry/Welshpool. At the many roundabouts follow signs to Oswestry where you continue on the A5 following signs for Llangollen/Wrexham. At the forth roundabout, join the A483 (sign Wrexham) and continue on A483 to a roundabout at junction with A55. Continue straight across, following signs to Chester A483 for 2.3 miles over three roundabouts and across River Dee. At next roundabout by statue, turn left (sign posted Queensferry A483, Ellesmere Port) into Nicholas Street. Turn left at lights (sign posted Queensferry A548, Sealand Industrial Parks) into Watergate Street, which becomes Sealand Road. After approx one mile, turn left (sign posted Chester City FC) into Bumpers Lane, and continue to end. There is ample parking at the ground at a cost of £3. Trains: There are trains from Hereford. Best check first. Chester Station is about two miles from the ground. By taxi: Up to £4. By bus: Take the Railink bus to the bus exchange, then the No. 10 which runs along Sealand Road. By foot: Leave by the main exit opposite the Town Crier, turning right into Station Road. Follow road to left, between the Egerton Arms and the Railway Inn. At end of street, by Stanley's, enter underpass. In centre, take first exit towards tall black and white building. Take steps straight ahead (sign posted Frodsham Street). Head towards the Oddfellows Arms, but before passing bridge, turn right into Gorse Stacks. Straight over crossroads by the Bull and Stirrup into Canal Street, and under dual carriageway. At junction, turn left, passing Telford's Warehouse on the right hand side, and over canal. Where road divides, turn right into South View Road. At T-junction, turn right into Sealand Road. The next left turn, after half a mile, is Bumpers Lane. Alehouses. Due to the Deva's somewhat remote location, a fifteen/twenty minute walk into town would appear to be the order of the day. The Coach and Horses and the Dublin Packet near the Town Hall have received recommendations while the Wetherspoons outlet is at 78 Foregate Street. Pick of the bunch however has to be The Mill Hotel in Milton Street, which offers a splendid range of ales together with large screen TV. After Hereford United's recent better run of form a good turnout of Bulls fans is expected for this relatively local game. Allow just over two hours from Hereford if travelling by car. Torquay have decided not to extend the loan of ex-Bulls loanee Matthew Halliday. Fellow Norwich player Rossi Jarvis and Southampton keeper Kevin Miller have also left the club at the end of their loans. Wrexham will appeal the dismissal of Steve Evans in yesterday's match with Shrewsbury. Should the appeal fail Evans will serve a five game ban as it was his third red card of the season. The club have also ended the loan of Cherno Samba after the player failed to score in three appearances, but are trying to sign Stoke forward Martin Paterson on loan. Boston midfielder David Farrell has agreed to waive the contract clause guaranteeing him a deal next season after the potential new owners refused to sanction the deal, barring Farrell from playing again for the club. Rochdale skipper Gary Jones will not play again this season after X-rays confirmed a broken bone in his knee. Peterboro are on the lookout for the people who have thrown objects at visiting players in two recent games. The club in under scrutiny from the FA following the incidents. Accrington loan keeper David Martin will not play for the club again after damaging an ankle just five minutes into his debut on Saturday. The Liverpool academy player didn't even touch the ball during his time on the pitch. Graham Barrow, Mark Wright's assistant at Chester, is staying with the League Two club despite being asked to join Swansea City. Late last week Roberto Martinez left Chester to become Swansea's new manager after Kenny Jackett had parted company with the South Wales club. Barrow has been talking to the Liverpool Daily Post. "I was flattered to receive the approach from Roberto, and I know he will make a success of his career in management but my heart and affection is and always has been with Chester City. "Mark (Wright) and the chairman have always been fair to me. I have always been an extremely loyal person and I want to repay the faith that Mark and Mr Vaughan have shown in me. "I believe that we have the makings of creating something extremely positive at Chester City. We have an enthusiastic chairman who backs his management team to the hilt, and a progressive manager who has some excellent ideas about the game. That's why I have come to my decision." Barrow recently spoke well of Hereford's Wayne Brown. The two will meet again tomorrow evening when Chester entertain the Bulls. The referee for that game is expected to be Lee Probert who called off the game two weeks ago. Yesterdat Probert, who is in line for promotion, was the fourth official at the Carling Cup final. Despite a credible ninth position in the League, Hereford United's gates have not kept pace with the teams success and must be viewed as somewhat disappointing for the season to date. So far 59,609 spectators have watched the 18 home games which gives an average gate of 3,312. That figure puts Hereford at 16th place for attendances. The average could rise slightly as there are two local derbies in the last five home fixtures. They are the games against Swindon Town and Shrewsbury Town. A gate of at least 4,000 would be expected for the Swindon game and hopefully somewhat higher for the Shrewsbury visit. Last season when Hereford United were in the Conference the average gate was 2793 which was 9% less than the 2004/5 average of 3068. The season of 2003/4 produced an excellent average gate of 3,704. Thankfully Hereford play 23 home games this season compared with 21 whilst in the Conference. The extra games will go some way to helping the income stream. Whether the two extra games will bring the total attendance up to the 2003/4 figure of 77,784 through the turnstiles remains to be seen but it may not be too far away. Raised admission charges will help income but against that there have been special deals for young children so the average 'charge' at the gate is likely to be about £10. On top of the League games there have been Carling Cup games against Coventry and Leicester, a Paint game against Shrewsbury, and FA Cup games against Shrewsbury twice, Port Vale and Bristol Rovers. For these games the gate is shared after expenses. Total attendance at these games comes to 32,336. Using a figure of 40% (estimated) of the gate for Hereford and an average gate price of £10, the extra income from these games could be around £130,000. Overall gate income will not be far from £900,000 this season (it will be more should Hereford achieve a play-off position). This compares with a figure of £634,794 for the 2004/5 season. Last season's figure will be officially released next month and will include money from the Conference play-off games. Supporters of Hereford United have broken the one thousand pounds barrier by entering the Coca-Cola 'Buy a Player' promotion. As at mid-evening the total raised to date is £1,030. It's easy to win money for Hereford United. Simply text the code from one of the promotional bottles/cans of Coca-Cola or go on-line to see if your code is a winner. Coca-Cola say that prizes range from 50p to £100,000. Every other pack is a winner. The promotion goes on until the 25th April 2007 so there is plenty of time to turn those codes into money for Hereford United. After collecting seven points form their last three games, Hereford United manager Graham Turner can reflect this morning that his club are well on course to a reasonable first season in League Two. "We are near enough safe now, so we may as well have a go and see if we can win some more games," Turner told the League Paper after yesterday's goal-less draw against Rochdale. Hereford are nineth in League Two with 48 points from 34 games. Whilst out of the clubs in mid-table Chester, Shrewsbury and Bristol Rovers have played less games, the Bulls would only drop three places if overtaken by all of their near-neighbours. Hereford travel to Chester on Tuesday for the postponed fixture from two weeks ago. If Chester win they will go above the Bulls but a point, or even better three, would keep the Bulls in nineth spot. There are no other League Two fixtures until next weekend except for today's Wrexham/Shrewsbury clash. After the Chester match there are just eleven more games for the Bulls this season. A resonable run-in could mean a top ten finish which would be an excellent start for Hereford United in their first season back where they belong. Meanwhile Rob Purdie is in the League Paper's team of the week after another good performance from him yesterday. Hereford United's defender Trent McClenahan flies out to Dubai today to join the Australian Olympic squad. McClenahan is one of three European based footballers in the squad for their crucial Olympic opening Group D qualifying match against Iran in Tehran next Wednesday. The three from Europe in the 20 strong squad are Perth Glory midfielder and 2005/06 Hyundai A-League Rising Star award winner Nick Ward currently with Brighton and Hove Albion, 2005 Young Socceroos co-captain and defender Trent McClenahan who is at Hereford, plus Danish-based striker David Williams. Australia's win over Chinese Taipei saw the team progress to Group D in the second stage of qualifying alongside Iran, Saudi Arabia and Jordan. Most of the squad are currently preparing in Dubai for Wednesday's match in Tehran. McClenahan will join them later today. Many Stockport supporters were well on their way to Bristol Rovers this lunchtime when their game was called off. A pitch inspection took place at 12 noon as supporters coaches were heading down the M5. The Bristol pitch has been waterlogged several times recently. The last time Hereford visited Rovers back in early January the pitch was hardly playable. However some Stockport supporters were incensed at the postponement and took pictures of the ground to try and prove their point. A few Stockport supporters diverted back to Hereford and were beleived to have attended this afternoon's game at Edgar Street. The late postponement of this game is the second time in two weeks that supporters of a League Two club have had to turn around well after leaving their destination. Hereford supporters received news that there recent game against Chester was off just two hours before the kick-off which had already been put back an hour. Meanwhile it was announced earlier this evening that Graham Westley has left Rushden and Diamonds. Graham Westley has this evening been relieved of his duties as manager of Rushden & Diamonds Football Club with immediate effect.The Club have decided that performances and squad selection do not fit with its long term plan.The Club wishes to make no further comment on the matter and the search for a successor to Graham will start immediately.The Club wishes to thank Graham for all that he has done during his short tenure at Nene Park. A controversial character, Westley("Attitude Is More Important Than Ability") is well-known to Hereford supporters from their time in the Conference. He use to manage Stevenage and previously Farnborough. After this afternoon's match Trent McClenahan told BBC Hereford and Worcester that today's draw with Rochdale was a fair result. "It was a bit frustrating in the end after Tuesday night. They had a few chances, we had a few chances." The Hereford United defender spoke about the change of formation from 3-5-2 to 4-4-2. "In the last three games we've only conceded once - two wins and a draw today. It's going well." McClenahan will miss the Chester game on Tuesday as he is to join the Australian squad. "I go away tomorrow but I'll be back on Thursday." Meanwhile in his post match interview manager Graham Turner has again confirmed that Steve Guinan will be able to play for the Bulls in the two games this coming weeks. "Yes, we've got him for Tuesday and next Saturday. We can have him for a total of ninety three days. We'll speak to Cheltenham early on in the week." Finally today's match sponsors, Talking Bull, made Danny Thomas their choice of the man of the match. However the PA stats only gave him a six whilst they gave Rob Purdie a top mark of eight. Hereford United played host to Rochdale this afternoon on an Edgar Street turf which had a significant part to play in Hereford keeping a clean sheet in what was an evenly matched encounter. Both sides were obviously looking to take all three points, with both enjoying a good run of form but they seemed to cancel each other out, helped by two good goalkeeping displays. United were unchanged in their starting eleven that demolished Lincoln in the week, but Tamika Mkandawire and Simon Travis returned to the bench at the expense of Phil Gulliver and Alex Jeannin. The match started brightly, with Rochdale quickly notching up two, of an eventual eighteen, corners before The Bulls won a corner of their own but nothing came of any of them. Steve Guinan, who seems to have a knack of netting in a Hereford shirt, wasn't quite so fortunate today as he squandered a number of chances; firstly scuffing wide with a clear view on goal on his weaker left foot. For Dale, Adam Le Fondre was a constant nuisance amongst the Hereford backline, and, with the help of a bounce that evaded Dean Beckwith, had a clear run on goal but Rob Purdie was quickly back to put him off, though the striker fired into the arms of Wayne Brown, saving the blushes of Beckwith. Alan Connell was perhaps the more dangerous of the two Hereford forwards, and he almost broke the deadlock midway through the half when he headed a Trent McClenahan cross just over the bar from eight yards out. Connell the turned provider for strike-partner Guinan, assuming possession in the box before crossing into the middle, where Guinan stood unmarked. He, however, mis-hit a volley, much to the amusement of the 340 travelling fans housed in the Blackfriars end, in a total attendance of 3,090. Guinan almost silenced the away fans in first half injury time after Steve Jennings found Williams on the right, who delivered a cross into the middle. Guinan had a free header but, most uncharacteristically, headed straight at Matthew Gilks. United continued after the interval from where they'd left off and enjoyed a spell of dominace when they really should have gone ahead. Connell fired wide on the turn following a long free kick, before he made a good connection to a fantastic cross by the impressive Danny Thomas, but Gilks denied him once again. This triggered a counter attack by Dale, and Brown made an important save from Glenn Murray, before McClenahan got in the way of a second effort from the same man. Jennings and man of the match Connell then almost pulled off a simple, but perfect free kick move, as Jennings quickly took it, threading a through ball between the two centre backs into the path of Connell, but Gilks was out to make a good save with his feet. At the other end, Brown denied Murray again before Dale had a superb chance to take the lead on seventy two minutes. Richard Rose, who was troubled by Le Fondre and Murray all afternoon, was held off by the latter, who burst into the box crossing to the former, who was unmarked at the far post. However, the Edgar Street turf gave way from under his feet at a vital time, and he fell to the ground and Beckwith was in to clear up the mess. Andy Williams combined with Ben Smith well on the right, and the stand-in-skipper delivered a good cross to Guinan who again headed straight down the throat of Gilks before Connell was replaced by Tim Sills with twelve minutes left. Graham Turner was perhaps thinking that Sills' aerial threat would be more beneficial as United were attacking well down the wings, but, especially with hindsight, taking off Connell who was probably Hereford's greatest threat might not have been the correct decision. However, United were still pressing, and a burst from the middle by Jennings caused havoc in the Dale box, but the ball was eventually cleared following a poor touch from Sills. Rochdale sub Louis Dodds forced a save from Brown late on before Guinan had one last chance for The Bulls. Brown played a free kick long which went all the way through to Guinan deep inside the box, but he was denied from a narrow angle by Gilks, who blocked his half volley and turned it behind for a corner before the final whistle was blown. United will be disappointed that they couldn't continue their winning form, but on the other hand will not be too disheartened having drawn 0-0 with one of the league's in form sides. There were plenty of positives to be taken, including the clean sheet and Danny Thomas' display on the left, as well as creating a number of chances. Maybe some shooting practice is in order this week in training! HUFC: Brown, McClenahan, Beckwith, Rose, Purdie, Williams, Jennings, Smith, Thomas, Guinan, Connell. Subs: Mkandawire, Thompson, Travis, Ferrell, Sills. RFC: Gilks, Brown, Stanton, McArdle, Goodall, Muirhead, Perkins, Doolan, Rundle, Le Fondre, Murray. Subs: Edge, Prendergast, Buckley, Dodds, Crooks. Hartlepool remain three points clear at the top after a 1-0 win at Boston, who remain one point above the drop zone. Walsall are second after a 4-1 win over Barnet, while Swindon move up to third after a penalty gave them a 1-0 win over Chester. Lincoln slip to fourth after a 2-2 draw at Accrington, for whom Stuart Fleetwood was again an unused sub. MK Dons' 2-2 draw with Notts County leaves them fifth. County have now got just one win in seven. Stockport remain sixth after their game with Bristol Rovers was called off with a waterlogged pitch, and Wycombe fill the remaining play-off spot after a 3-2 loss to Mansfield. Down the bottom, Torquay new regime saw their side lose to Darlington 1-0 thanks to a late Julian Joachim goal, while Wrexham play Shrewsbury tomorrow. The Dragons now have two games in hand on Boston. Macclesfield moved five points away from danger with a 2-1 win over Grimsby while Bury remain in danger as they lost at home to Peterboro 3-0. Some very suspect finishing from both sides saw a lively 0-0 at Edgar Street between the Bulls and Rochdale. Both team dithered in the six yard box as the defences struggled to clear the ball and the strikers failed to get accuracy from point blank range. The point keeps the Bulls in ninth, six points short of the play-offs. Ryan Green is expected to miss more games for Bristol Rovers. The ex-Hereford United defender may require a skin graft to help the healing process after an injury in a Rovers game at Grimsby last month. Any graft could mean an extra few weeks side-lined. "I went to clear the ball, kicked the bottom of North's boot and his studs went straight through my boot and right through to the bone," Green told the Western Daily Press. "At first I didn't even realise what had happened and carried on playing for a couple of minutes, but then I looked down and saw my boot ripped open and bits of flesh hanging out. "The doctor said to me the gash was only a fraction away from the nerves, so I'm lucky in a way, but it is not healing properly and there's a possibility I may need a skin graft. If that's the case, I may be looking at another month out." Graham Turner, the Hereford United manager, is well aware that Rochdale will be another difficult fixture for the Bulls. "Both of the front players played for Stockport against us on the opening day of the season; [Glenn] Murray was on loan and [Adam] Le Fondre was up front for Stockport. "Both of those caused us one or two problems and we know that they'll be difficult to play against." "Consistancy is the order of the day between now and the end of the season. "If we can gain some consistancy and pick up good points particularly in this next period, it will decide whether we will be also-rans or have a realistic chance of being up there." He has also confirmed that talks are on the agenda with Cheltenham over an extension to the loan of Steve Guinan. That implies that Guinan can play at Chester next Tuesday and Hartlepool on the following Saturday. However that will take his initial loan over a month as he first played for Hereford on January 27th. Chester City have cut prices in a bid to get more locals back to the Deva Stadium. After barely 1,500 home supporters turned out for their Wednesday match with Bury the club have announced a £2 reduction in admission across the board for the visit of Torquay on March 1st. Both that game, and the Bulls trip up the A49 next Tuesday, will also see Kids being allowed into the West Stand free of charge with a paying adult. As the West Stand is home supporters only this promotion is unlikely to be open to away supporters. Chester have also announced that they are to report a small operating profit for the 2005/06 season, the first time in several years that the club has turned a profit. The full results will be published at the, yet to be announced, AGM. Meanwhile, Chester captain Roberto Martinez has been confirmed as the new manager at Swansea. The former Swans player officially left Chester earlier this afternoon and is reported to be taking Chester assistant Graham Barrow with him as his No.2. Rochdale manager Keith Hill is confident going into Saturday's match at Edgar Street. His side has not lost on the road since his first game in charge and come to Edgar Street with eight points from their last four away games. Hill told the local press: "We have created an environment in training that is reflected and replicated in games. The whole squad have a desire and hunger to win. They understand how to win, they enjoy the feeling of winning and they are used to winning." Leading scorer Chris Dagnall (foot) will miss out with a foot injury, and skipper Gary Jones picked up a serious knee injury during the midweek win over Torquay: "Gary is our Captain Marvel and is an example to the rest of the lads so it is a big blow to lose him, but we have players to come in." Simon Ramsden, who missed the Torquay game, should be fit while David Perkins is pushing for a starting spot. Meanwhile Reuben Reid, their on-loan striker who was sent back last week, has been suspended by Plymouth over his behaviour at Spotland. The striker was sent packing just two weeks into a loan that was due to last the rest of the season. He also had a loan spell at Kidderminster cut short after he headbutted Exeter defender Chris Todd. Grimsby striker Michael Reddy looks to have played his last game for the club, with manager Alan Buckley admitting the former Sunderland striker will not regain fitness this season. Reddy, 26, has struggled with injury throughout his career, making just 120 starts in eight years. Torquay have appointed Keith Richardson as their new permanent Chairman. The owner of the Grand Hotel in Torquay has been a long term suitor of the club. The club have also signed Alistair John on loan from Charlton for a month. Chester want Swansea to make a quick decision on whether they want Roberto Martinez as their new manager. The former Swans midfielder has held talks with the club this week. Shrewsbury's latest accounts confirm that the club are still losing £6-£7,000 a week. The club made a profit last season of £300,000 but only after £700,000 in player sales. They expect the losses to disappear once the move to the new stadium is completed. Bury have signed defender Darren Kempson, from Crewe, and striker Tony Bedeau, from Walsall, on loan for a month. Mansfield have signed Blackburn midfielder Bryan Hodge on a months loan. The 19 year old is yet to make his debut for the senior side. Hereford United manager Graham Turner has been talking to the Worcester News in advance of the visit of Rochdale to Edgar Street on Saturday. "We are confident but we have got to make sure that confidence isn't misplaced. "I am sure Lincoln felt confident after they beat Walsall before they played us. We have to guard against any complacency. It was an excellent performance. We scored four but it could easily have been eight. We created that many chances. "We are starting to look upwards at the play-offs and a few good results might put us in there. "Our aim at the start of the season was to get enough points to avoid relegation and we are close to getting that. "Then we can move on to the next target which is to get in the top half of the table." Turner will be without Simon Travis, Martyn Giles and probably Glyn Thompson for the game. However Captain Tamika Mkandawire may return to the squad. Graham Turner is to be presented with a specially engraved crystal football in a presentation to be screened on Sky Sports' Soccer Saturday this weekend. Each week the F&C Investments Performance of the Week Award is given to a team who has performed well and their choice this week is Hereford United after the Bulls' excellent 4-1 win away to promotion hopefuls Lincoln City on Tuesday night. Trent McClenahan could miss several games for Hereford United as he has been called up into Australian Olympic squad. "Trent has been picked for a game in Iran, so we might lose him next week," manager Graham Turner told BBC Hereford and Worcester. "He might miss several more games between now and the end of the season having been selected for that squad." Meanwhile, in his weekly interview with the station, Graham Turner has also spoken of the change in formation used in the last few games. "The players took it all on board - they adapted very well to it. "Sometimes during the course of a season, things like that can present a fresh challenge to players. "But they're refreshed by the change of systems and they look as though they are enjoying the new approach." Finally on-loan Bulls striker Stuart Fleetwood scored twice for Accrington in a reserve game against Wrexham last evening. Steve Guinan is not currently on the Cheltenham squad list as published on their website. Usually when a player goes out on loan reference is made to that loan on the websites. For example Keith Lowe is on loan at Cheltenham from Wolves and he is on the Cheltenham list. Guinan's loan at Hereford finishes shortly and an announcement about his future has to come in the next few days. His first game for Hereford was against Notts County on January 27th so he can not play for the Bulls after Saturday's game against Rochdale unless or until an extension to the initial loan has been agreed. The Hereford Times has reported that Hereford United's HFA Senior Floodlit Cup semi-final game against Westfields will take place at the allpay park on Tuesday March 6th. Lincoln midfielder Leon Mettam has been given a four game ban for the lunge at Dean Beckwith that saw him red-carded in Tuesday's match. It was his second straight red of the season. Wycombe have signed Derby teenager Lionel Ainsworth on loan until the end of the season. The forward has just played twice on loan at Halifax, scoring once. Kidderminster boss Mark Yates has been charged by the FA over the alleged headbutt to Exeter's Lee Elam. Yates will request a personal hearing and the Kiddy board have refused to comment on the situation. Torquay are trying to sign Michael Branch, who quit full time football when he left Chester. Branch, who currently works in property development, is still only 28 and used to work with both manager Colin Lee and coach Keith Curle at various clubs. Boston's barebones squad has just got smaller after it was revealed that David Farrell won't play for the club again at the behest of the prospective new owners. Farrell has a clause in his contract guaranteeing him a new 12 month deal if he makes 30 appearances, and he is set to remain on 29 after the consortium refused to sanction the deal. Chester moved up three places to 11th after beating Bury in the only League Two clash last night. It drew a disappointing 1,642 gate, and the crowd jeered the players off at half time following a poor display. Chester scored with an 89th minute penalty. Hereford United have sent a letter to the caterers at Edgar Street asking them to improve their standards. The contents of the letter have been released by the Official Site. Following the disgraceful situation when out of date pies and sausage rolls were delivered to our ground for sale to supporters, we have now received complaints that canteens are selling out of date crisps. This is a situation that is intolerable to us and to our supporters. We now require assurances that measures are put in place to prevent the problem reoccurring. The effects of the incidents are that supporters have lost faith in your ability to provide the service required. We have monthly liaison meetings with a small group of supporters. We would therefore suggest that a representative from your company attend a meeting to reassure the group that you will treat the matter with urgency and measures are put in place to prevent it happening again. The club will be supported by the vast majority of supporters who come to Edgar Street over their stand. A few weeks ago there were no lids and trays available for the fans to take their very hot coffee back to their seats. Very dangerous especially when children fetch drinks for their adult companions. Lindley Catering, who are based at Stoke on Trent, claim to be the UK's leading sports stadia caterers in professional football, cricket and rugby. Established in 1968, their turnover is around £30 million. They have 42 Football and Rugby Public Catering Contracts and employ 400 Full-time and 10,000 Part-time staff. Former Bull Danny Carey-Bertram has found himself at the centre of a complaint by current side Forest Green Rovers. The ex-Bulls forward, who left Edgar Street last summer, was asked to leave the field during last Saturday's defeat to Southport because he was wearing 'illegal' clothing. The player was wearing black 'tights' under his black shorts and black socks, which were deemed illegal by referee Peter Quinn. During the four minutes that it took Carey-Bertram to remove the items, FGR conceded the first goal. 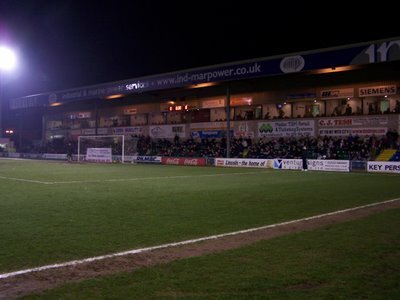 FGR claim that the player, and some of his team mates, have worn the same garments in previous matches without complaint and that several high profile players also do the same. FGR have asked the Conference and FA to clarify the rules. Controversial chairman Chris Roberts has resigned from the board at Torquay United, with rebel director Mervyn Benney taking temporary control. Last week Benney, and two other long serving directors, issued an ultimatum to Roberts that it was him or them to leave. Roberts, in his usually defiant manner, accepted their resignations. Torquay United had earlier declared that it is 'business as usual' despite having told it's behind-the-scenes staff that they were being made redundant. "On Monday morning we were made redundant then on Monday evening we were re-instated with the promise of a new owner for Torquay United with immediate effect. The newer owner was due to meet with all the staff yesterday (Tuesday) morning and we are still waiting!!! It is a very worrying and confusing time for everyone, but myself and all my staff have been carrying on regardless, what else can we do? We have a game on Saturday and it won't organise itself. It is business as usual and we urge all the fans to get behind the team on the football field whilst we address and resolve the issues off the pitch." Fans are jubilant at the news of Roberts' departure and it is expected that Mike Bateson, who is still the major shareholder, will return to the club after just four months away. Since his departure, the club have won just two games to be seven points adrift of safety at the bottom of League Two. Hartlepool are the new leaders after beating Macclesfield 3-2. Both Walsall, who had led for about three months, and Lincoln lost - with Walsall losing 1-0 at Stockport - their eighth straight league win without conceding a goal. Fourth placed Swindon also lost, 1-0 at Barnet for whom Oliver Allen, son of Clive, scored his first senior goal. Down the bottom, Torquay are seven points short of safety after a 2-0 loss to Saturday's opponents Rochdale. Wrexham's 2-1 defeat to Grimsby dumps them in the drop zone after Boston's 1-1 draw at Peterboro. Accrington remain in trouble after a 2-1 loss at Darlington, now nine games unbeaten, with Bull Stuart Fleetwood not even getting off the bench after being brought off at half time on Saturday. In other results, MK Dons stay fifth after a 1-1 draw with Mansfield, and Shrewsbury beat Notts County 2-0 to move into the top half of the table. Ben Smith, the Hereford United stand-in captain, was pleased with last night's win at Lincoln. "We knew that a team near the top of the league were going to come at us early," Smith told BBC Hereford and Worcester. "In a lot of games whoever gets the first goal normally goes onto win and we knew that we might have to weather a bit of a storm. "But in fact it went the other way and we started off really well, got one goal up and took it from there." Meanwhile the Lincoln manager wasn't too happy. "People know I like to keep a level head," said John Schofield. "But I'm disappointed with last night's result. In fact, I'm hurting like hell. "But we created a lot of chances, probably enough to win the game." However he did think the referee's decision to send off a Lincoln player was correct. "I didn't think the decision was harsh, I thought it was a spot-on. "It was merited and I have got no problem with that at all." As well as the great result, Hereford United supporters will have been impressed with the facilities of Sincil Bank, the home of Lincoln City. A quick walk around the stadium showed several bars doing a fair bit of trade and some excellent training pitches next door. The view from the Co-Op stand, where the Hereford supporters sat, was excellent. Perhaps one slight criticism would be the food which was bog-standard. But the view has to be of a well-run club obtaining a fair income from off-pitch activities. Hereford United had 52% of possession in the game at Sincil Bank last night. The PA Stats for last night's game gave the Bulls' Andy Williams a nine, the top mark anywhere in League Two. Hat-trick man Steve Guinan was given an eight and most others players received a seven except Thomas, Rose and Jennings who only got a six. For a side who played as well as they have at anytime this season the stats are surprisingly low and will be questioned by supporters who were at the game. Trent McClenahan was yellow carded for dissent. Hereford had eight attempts on goal whilst Lincoln had five. And there were few fouls, the Bulls were penalised six times and the Imps five. A mention too for the referee, Mr Salisbury, who kept the game flowing. Lincoln defender Paul Mayo's pre-match claim that an attack minded Hereford United would play into their hands certainly backfired in a big way on Tuesday evening as United produced a scintillating display of free flowing one touch football that at times left the Imps and their supporters gasping for breath. In fact one home supporter was overheard to say after the game that he had never seen football like it in League 2. It was as usual a game of two halves but on this occasion they both belonged to the rampaging Bulls. Hereford, all too often slow out of the blocks, opened their account as early as the second minute when a cross from the left found Alan Connell lurking 12 yards from goal. His neat turn provided an opportunity and he coolly fired into the right corner of the net beyond the reach of home keeper Alan Marriott. It was clear from early on that the game was going to provide splendid entertainment for the crowd and, indeed, Lincoln's on-loan striker Spencer Weir-Daley tested Wayne Brown with a shot from 15 yards in the eighth minute but Brown was well placed to collect. Around the quarter hour mark, both Connell and Andy Williams saw good efforts narrowly miss the target and as the half entered the final 15 minutes Weir-Daley found himself clear on goal but the excellent Brown was quickly out to smother the shot. The Bulls found the net again in the 35th minute when a Danny Thomas cross was met by a thumping header from Ben Smith. Unfortunately, the "goal" was disallowed for a holding infringement. However, just a minute later United got their just reward. The advancing Trent McClenahan drilled an inch perfect cross to the feet of Guinan who hammered in from 6 yards to give the Bulls a well-deserved two-goal half time lead. The second half produced another early goal for the visitors. This time, the half was just sixteen seconds old and the mid-match coffee not even drunk when the ball fell to Guinan 12 yards from the target and in a style reminiscent of a few years ago Stevie G planted the ball firmly passed a well-beaten Marriott. Just eight minutes later the hatrick was completed. Andy Williams scorched down the right flank, dropped a shoulder and then cut in to the box to fire in a shot, which Marriott was only able to deflect upwards. As the defence pushed up, Guinan coolly headed the ball high over everyone and into the top left corner of the net. Mass celebrations erupted in the visiting fans section as Guinan raced to the touchline to take a theatrical bow. The fans were, as you would expect, in full voice; immediately enquiring - Turner, Turner, what's the score? The Imps did get a goal back shortly afterwards when Weir-Daley forced home a Nat Brown flick-on but there was no doubt that Hereford were full value for their 4-1 lead. In general, it was an excellent spectacle for the fans with good quality, fast, passing football from both teams spoilt only by a shocking late tackle on Dean Beckwith by Lincoln substitute Leon Metton whose eight-minute contribution was terminated by a straight red from referee Mr Salisbury. The team performance from the Bulls squad was superb from back to front. Wayne Brown was on top form and the defence was well marshalled by the outstanding Beckwith with Rose rarely putting a foot wrong. Rob Purdie and McClenahan (best game so far) completed a first class defensive 90 minutes while the graft and no small amount of skill from Jennings and Smith gave little scope to the Lincoln midfield. Wide players Thomas and Williams continually tormented the home back division and Connell's non-stop chasing was rewarded with a well earned rest for the final fifteen minutes when he left to be replaced by Tim Sills. Steve Guinan is truly looking back to his best with three goals and a display of his full repertoire of flicks and defence opening passes. Hereford United put on their best display of the season at Sincil Bank last night and defeated Lincoln City 4-1. In front of 150 away supporters the Bulls played some excellent passing football which resulted in a hat-trick for Steve Guinan with Alan Connell grabbing the other. Hereford move up to ninth place in the League table. Ben Smith has been named in the Football League team of the week for League Two. The midfielder, who captained the Bulls in the absence of Tamika Mkandawire on Saturday, recieved the award for his fourth Bulls appearance since returning to the club. He is the first Bulls player in 2007 to get the award. "We will be on a revenge mission, having lost 2-1 to them at home on our first match back in the Football League. In the first half of that match, they certainly gave us a lesson of what this division is all about and are in a strong position. "Even so, if we can reproduce the form we showed at Swindon and Milton Keynes, we will have a chance of reversing that defeat." The WDP reports that Tamika Mkandawire will be included in the squad but Simon Travis will miss out due to a six inch cut to his ankle that is likely to sideline him for a couple of weeks. Rochdale have extended one loan signing, and taken on another, ahead of Saturday's clash with the Bulls at Edgar Street. Dale have extended the loan of Stockport striker Adam Le Fondre for another month. The 20 year old has scored twice in three games and the club are unbeaten in the games he has played. Joining Le Fondre is Leicester trainee Louis Dodds, who scored three times in a six game loan spell at Northwich at the end of 2006. Dodds is the tenth player to arrive at Spotland since Keith Hill became manager. In other news, Boston will have just 14 fit players for tonight's trip to Peterboro. Seven of their side are sidelined through injury, while Trevor Benjamin is ineligible as he is on loan from the Posh. Mansfield striker Matt Hamshaw has been given time off for 'personal reasons'. The midfielder has been a virtal ever present this season. Meanwhile the independent supporters association SFFC, Stags Fans For Change, have announced that a recent survey saw 88% of supporters wanted to see chairman Keith Haslam out of Field Mill. The FA have confirmed that Kidderminster Harriers manager Mark Yates is being investigated for his alleged headbutt on Exeter midfielder Lee Elam. An FA spokesman told the local press: "We are aware of an incident that occurred at Kidderminster. We have received a report from the officials and we are in the process of making further enquiries, which will involve video footage and so on." "We haven't done anything at all yet, we're just going to sit down and see whether the FA send us anything. There's a lot of stories going round and it's half a dozen of one and half a dozen of the other at the moment. We haven't got any proof and we've got to look at the video and wait for the referee's report which will probably come through tomorrow." Yates is widely reported to have marched 60 yards down the touchline before confronting Elam, with not one report blaming Elam for the incident. Peter Gilmour, the Ross-on-Wye based sports hypnotherapist, has been called in by Robins manager John Ward to help his side in their battle to beat the drop down to League Two. Ward told the Western Daily Press: "Peter has been coming in on a regular basis and talking to us in small groups and as individuals. "You can get carried away by the titles, but it is basically just psychology. "It is something I have done before at other clubs; other sportsmen use it and businesses also. "I was offered the opportunity to explore it and I'm pleased that I did. I have been impressed with him. "It has done more than some good because people have bought into it and there is quite a demand for his time." Since Gilmour's arrival at Cheltenham Town the team has lost just two games in their last 11. "I can't say it hasn't helped us in our recent form and that it is not working," Ward continued. "A lot of people in daily life could benefit from this opportunity, but they haven't got access to it. "People will rubbish it, but all I would say is that you shouldn't criticise something until you have tried it." It was beleived that Gilmour was called into Edgar Street last season well before the Bulls won the Play-off final at Leicester and gained promotion to League Two. Lincoln City defender Paul Mayo thinks Hereford United have to win this evening's game at Sincil Bank if they are to stand any chance of reaching the play-offs. "Hereford have got to go for the win - a draw or a defeat will pretty much end what chance they have of the play-offs," Mayo told the Lincolnshire Echo..
"That will play in to our hands because we are at our best when teams attack us - we seem to have more problems with teams who come to Sincil Bank and sit back. "Two weeks ago, for example, Torquay put 10 men behind the ball and we found it difficult to break them down. "The one goal was enough for us to win the game, but it was a bit edgy towards the end - especially when they got a set-piece just before the whistle. "I don't believe Hereford will do that tonight - and that can only be a good thing as far as we are concerned." Lincoln City Director Of Football John Deehan has warned his side that the Bulls won't be the pushover that may Imps fans are expecting. "After a slow start to this season, when they were probably adjusting to life back in the Football League, Hereford have improved a lot. When you consider they were well behind Accrington Stanley in terms of points, that's quite surprising. I went to watch them on Saturday and they were solid and could have won by a lot more. People may look at the fixture list and think it's a home banker for us, but there is no such thing." "Hereford gave us a very tough game at their place. We were hanging on at the end to ensure we clinched the three points. They are not going to be a pushover and they have steadily improved since they came up from the Conference. It would be pointless if, having beaten Walsall, we lost tomorrow night - so we have to ensure we treat Hereford like Walsall." With Smith fit, Lincoln's only doubt at the moment is striker Dany N'Guessan. The former Boston loanee is yet to start for the Imps and missed the Walsall match with an ankle problem. Sixteen goal striker Jamie Forrester is out suspended, as is defender Lee Beevers, so twelve goal Mark Stallard is likely to be partnered by Spencer Weir-Daley. The loan forward from Nottm Forest scored both goals against Walsall. Hereford United's captain Tamika Mkandawire is said by the Worcester News to be a slight doubt for tomorrow's game at Lincoln. The paper suggests he is still suffering the effects of a groin problem. However Graham Turner has told BBC Hereford and Worcester that the squad is big enough to cope. "We've got a fairly big squad now. "You look out on the training field - we've got the numbers there." Meanwhile Graham Salisbury from Lancashire will be the referee. Mr Salisbury is one of the more lenient referees in the Football League, and booked no-one when he refereed at Edgar Street in October as the Bulls drew 1-1 with Darlington. Trevor Owens, head of sport at BBC Hereford and Worcester, has confirmed that there will be full match coverage of tomorrow's Lincoln/Hereford League Two game on 94.7FM in Herefordshire. Keith Hall will be the reporter at the game. It will be Hereford's first visit to Lincoln for ten years. The official Dagenham and Redbridge website has confirmed that Bulls midfielder Jon Wallis has joined the club on a one month loan. The former Gillingham man has not appeared in the Edgar Street first team for five months, playing just 16 minutes for the Bulls in two late substitute appearances. He spent time on loan at Dover Athletic and came back to Edgar Street with the intention of fighting for his place, but was quickly sent on trial to Dagenham for whom he has played twice in the reserves. Providing the loan, which can be extended to the end of the season, is successful Wallis will join Dagenham on a permanent basis in the summer and is not expected to return to Edgar Street. Chester captain Roberto Martinez is one of the favourites to become Swansea's new manager. The former Swans player, a Bulls target in the summer, has refused to talk about the speculation but bookmakers have installed him at the front of the queue. Boston manager Steve Evans has vowed to remain at the club until the summer at least after his side lost heavily at home again after fans barracked the unloved manager throughout the game. The Pilgrims have collected just one point from the last 18, and have conceded 17 goals in that run - making them the worst defenders in the Football League. Exeter are to leave the incidents that marred Saturday's game at Kidderminster to Kiddy and the Conference. Midfielder Lee Elam was allegedly headbutted after the game by Kiddy boss Mark Yates, and an Exeter club statement says the side will focus on their promotion push. Hereford United travel to Sincil Bank for their next League Two game tomorrow evening against high-flyers Lincoln City kick-off 7.45pm. When the two teams met last August in the first home game of the season at Edgar Street, Lincoln won an enjoyable game 2-1 in front of 4405 supporters including 246 in the away end. And anyone who watched their game on Sky last Friday at Walsall will have seen that Lincoln will be a difficult side to beat tomorrow. That evening in August Rob Purdie converted his first penalty of the season for Hereford and although Alan Connell got the ball into the back of the net it was disallowed. Mark Stallard scored a brace for the Imps. It was the first time Scott Tynan had played in goal for the Bulls. Wayne Brown had been injured at Stockport and Tynan was hired as reserve 'keeper Glyn Thompson was unfit. Tynan was beleived to have arrived at the Street earlier that afternoon and so had little time to get to know his team-mates. Stallard's first goal caught Tynan 'flat-footed'. Whether Hereford would have forced a draw had 'Superman' been in goal is open to debate. Since that game the Lincoln squad has remained much the same but the on-loan signing of Spencer Weir-Daley from Nottingham Forest looks a very shrewd move by manager John Schofield. His two goals last Friday were well taken. He will need to be carefully marked tomorrow. Both Jamie Forrester and Lee Beevers will miss the game as they are suspended. Otherwise Lincoln are likely to start with much the same side as played against Walsall. Paul Mayo may replace Beevers. As for Hereford, captain Tamika Mkandawire will be available after he missed last Saturday's game through suspension. 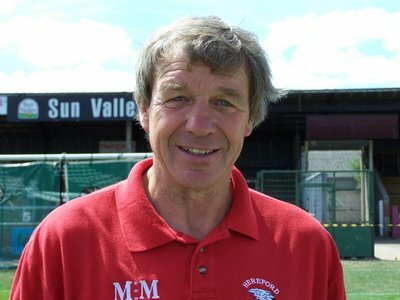 However who he will replace is uncertain and could depend on what formation manager Graham Turner decides to go with. The formation could also determine whether Turner keeps Danny Thomas in the starting eleven. Whatever he decides the Bulls will be without Simon Travis, who received a calf injury on Saturday, and long-term absentees Glyn Thompson and Martyn Giles. Stephen Jennings was subbed on Saturday but he was understood to have been suffering from a heavy cold and could be fit again for tomorrow. Andy Williams will be looking for a full game after coming on as a sub in the last three. He may start in place of Alan Connell. Graham Turner mentioned the game last Saturday in his post-match interview. "It's a nice challenge now on Tuesday, they (Lincoln) look a very good side having watched them last night I thought they were decent so it's a nice one to look forward to." Meanwhile Steve Guinan spoke about tomorrow's game to BBC Hereford and Worcester. "It's always a tough game at Sincil Bank. I've played there quite a few times down the years. It's going to be a tough game but that's what playing in this division is all about. "If you've got any asperations about getting into the play-offs and getting promoted those are the type of games we've got to be mentally strong and physically strong and go up there and try to get something." Both Alan Connell and Phil Gulliver have also played at Sincil Bank. Lincoln City were formed in 1884 and have always played their football in the lower leagues including dipping their toes into the Conference in season 87/88. They have also had their financial ups and downs but currently find themselves amongst the front-runners in this seasons League 2 campaign. Sincil Bank became an all-seater stadium at the beginning of 1999/2000 season with a capacity of over 10,000 making it arguably one of the best facilities in the Division. Visiting fans are accommodated in part of the Co-Op Community Stand where admission for adults is £17 (£15 if prepaid), concessions £12 and U15s £6. Concessions apply to over 60's, students aged 16 or 17 in full time education and the disabled. Please note that the £6 tickets need to be purchased at the ticket office before going to the turnstiles. By Car - To Worcester then M5 north, M42 and continue onto the A42 joining the A453 just before the M1. Follow signs for Nottingham and then join the A46 (sign Newark). Follow the A46 into Lincoln (which leads in to the High Street). Sincil Bank is well signposted from the city centre. Parking is either in the streets around the ground or on the 'South Common' which is a five-minute walk from the ground. Refreshments. The Supporters club at the ground (The Centre Spot) does admit visiting fans whilst the best bet for a 'proper' pint is without doubt The Golden Lion in High Street. The George and Dragon and The City Vaults have also received recommendations.